We are frugal so that our retirement savings will last as long as we do! At the same time we try to consume responsibly so that our choices have the least negative impact on our fellow humans and on our earth and its creatures. 1. We bought our more-or-less weekly dozen eggs at church from a friend who raises chickens on her farm. We happily pay $4 for them. The yolks are super yellow because the chickens walk around and eat bugs. 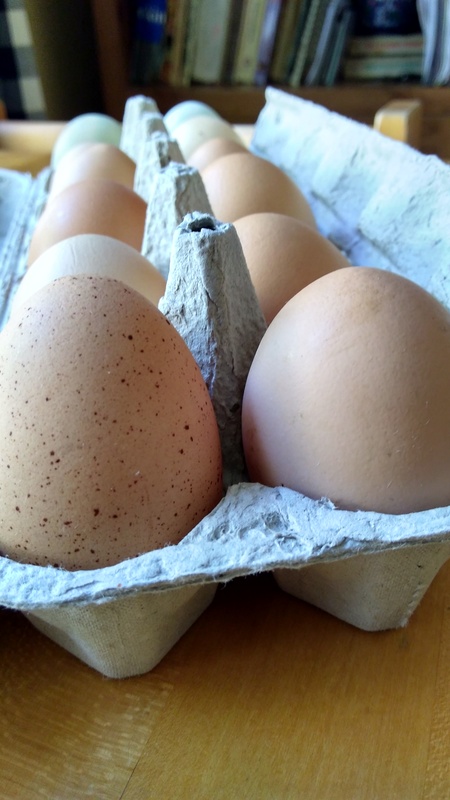 Sometime soon I will write about why Len and I are grateful to pay four times more for Heidi’s chickens’ eggs than on-sale-at-the grocery-store eggs cost. 3. Met a different friend for lunch. It’s an hour to drive to my old town from my new one – 4 gallons of gas - so I try to put together two “play dates” on the same day. Today Pat and I had lunch at a place where a guy I used to work with is still manager. This generous guy comped BOTH our lunches! 4. Pat and I are thrifters from way back. After our delicious and unexpectedly free lunch we walked to a Salvation Army store where we found a few things for my grandbaby. The “Awww…” sighs from the aisles we checked out? Pricelesss. 5. When I drive off for a long day I take a filled water bottle with a tea bag in it. I’m usually thirsty and tired on the way home (all that talking!). The steeped cool tea saves a drive-thru. My water bottle should have an odometer on it. It’s been to Duluth, Lake Superior towns in Wisconsin, to Arizona, and to Chicago and Madison many times. This is not complicated stuff – but it’s real, isn’t it? Are you watching the Ken Burns and Lynn Novick Vietnam documentary? Sometime this week I will write about how that war started my frugal life. What did you do to be frugal lately? Was it exciting or boring? I think your water bottle needs to take a trip to Judy's house, and bring you along!